Merry Christmas from Logan, Hayden and Madison. I love the Christmas season and always enjoy receiving cards and letters at this time of the year with updates from friends and family regarding the year that’s just passed. 2014 has been yet another very exciting year in our household, with the kids growing quickly and our lives full of activities, so here’s our own annual family update. Our oldest son Hayden turned 9 in March and is growing into a fine young man. He will be in Grade 4 next year and he loves school. He had his first season of Australian rules football with a local footy club and absolutely loved it. His enthusiasm, speed and stamina make up for any skill deficits and we were very lucky to find a club that has terrific coaches. He’s still playing basketball, but footy is his first love. 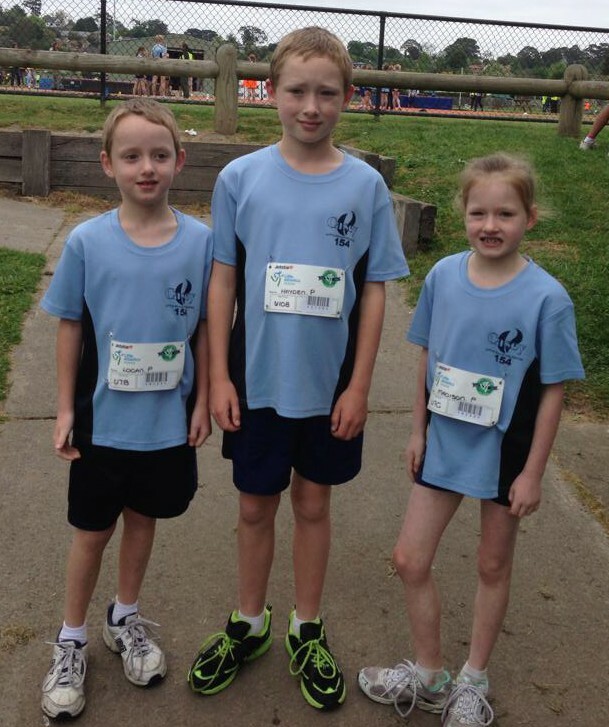 He and the twins also started little athletics this year which has been a lot of fun. His specialty is the 400 and 800 metres where he regularly wins by significant margins. He also started his animal blog this year and has written 100 posts already. Add in swimming and piano lessons throughout the year and you can see that he’s been kept very busy. Madison turned 7 in November and started school this year. She had a terrific start to her education and has made some lovely friends. As the year went on she got bored with dancing and gymnastics, but she has started little athletics as well. Much to our surprise, she won her cross-country at school, so we may have a little runner on our hands. She is also gradually making progress with her swimming and is badgering us to start piano lessons, so that could be next. Logan also turned 7 in November and seems to be growing taller by the day. He started playing basketball this year and is having a great time. He scored his first points last week which was a family highlight. We had some concerns about him in the first couple of weeks at school, but he had a fantastic teacher and soon thrived. By the end of the year, he was feeling really confident and doing really well with his reading and maths. He’s also doing little athletics and has a very distinctive (if not very effective) running style, but at least he’s enjoying it and is setting new personal bests every week. He’s also doing well with his swimming and is probably a better swimmer than me already. They are fantastic kids and we are very proud of each of them. Karen has had a great year as well. With the twins starting school, she’s had more time to dedicate to our business and some extra projects. She coordinated a fantastic backyard renovation which we love. She also is our kids’ biggest fan and loves watching them participate in their myriad of activities. For me, this has been a phenomenal year. To be able to make a living doing something that I love, whilst making a positive difference in people’s lives is an enormous privilege and I feel very blessed to be able to do what I do. I have met some fascinating people through our business and have spoken to some great churches and groups. There have been some challenges along the way, and I would appreciate your prayers for my dad who is very unwell at the moment, but I’m very excited about the year ahead and can’t wait to launch into 2015. From my family to yours, we wish you a Merry Christmas and pray that 2015 is even better than this year. Next post – Because Of, Or Despite?